Bring a refreshing and simplistic presence into your living space with the Bay Cliff Cocktail Table. 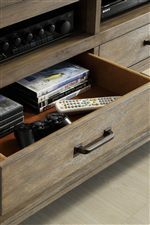 Crafted from hardwood solid and Primavera veneers, it features a light Cove Driftwood finish on woodwork. A fixed bottom shelf offers convenient space for accents and decor, and above, two drawers provide room for tucking away living items and accessories. Each drawer is decorated with a simple hardware bar pull. Matching hardware accents decorate each table leg. The Bay Cliff Rectangular Cocktail Table with 2 Drawers by Riverside Furniture at AHFA in the area. Product availability may vary. Contact us for the most current availability on this product. Accent your home with the Bay Cliff Occasional Grouping. Crafted from hardwood solid and Primavera veneer, all pieces feature a light Cove Driftwood finish on the woodwork. It has a natural look and feel that is refreshingly simple. Convenient storage options like drawers and bottom shelves offer space for accents and decor. Finished off with hardware bar pulls and hardware accent on the legs, the Bay Cliff Grouping is a lovely addition to your living and entertaining room. The Bay Cliff collection is a great option if you are looking for Casual furniture in the area. Browse other items in the Bay Cliff collection from AHFA in the area.